From the minute I arrived at the meeting, some uninformed and disconnected community members attacked me verbally. They assumed, without facts, that I was there in a commercial capacity. That I had a secret agenda. That I was trying to hijack a public space for commercial gain. That my heart was rotten and greedy. The level of distrust and lack of understanding was astounding and was a real test of my integrity and a lesson in how to bite my tongue. It was a sign of how broken the system actually is and critically how disconnected community members are to their own environment, where their food comes from and each other. My initial reaction was to be depressed. I came home to my wife and said that some days, I just feel like giving up. I couldn’t believe how a small minority of community members armed with animosity and no facts could leap to their own conclusions and whip up a frothy over their own lack of curiosity or need to know. Don’t get me wrong, I admire those community members who fight for a better environment for their neighbours, who form action groups, neighbourhood watches and regenerate their neighbourhoods, but similarly, I also abhor those that are so narrow minded and so settled in their ways that they don’t see the tree’s for the woods. For those community members who are incurious, I thought I should share the following piece I wrote for an American Magazine about the genesis of Neighbourhood Farms and why I think it’s so important. Perhaps, it’ll help them to become allies. Did you have an “ah ha” moment that sparked Neighbourhood Farms? Neighbourhood Farm is the most important initiative I’ve undertaken in my life, and I’m afraid that there’s no short answer. I was (and still am) filming a documentary about the last 350 leopards that survive on the Cape Fold Mountains of Southern Africa. I kept coming across conflict between wild animals and domestic livestock farmers protecting their livelihood. The deeper I delved into the why, the more I realised that if I wanted to try and save the leopards from a regional extinction, my focus would have to be on that human created biome, the city, and her inhabitants for solutions. A 100 or so years ago the earth had a largely rural population where the gap between farmer and consumer was minimal. In most cases, we were the farmer. Fast forward to current times and our mass migrations into the cities of the world for the perceived land of milk and honey and the gap between farmer and consumer has become so wide that it has created unforeseen and hidden problems for both the farmer and us. We are no longer rural and no longer produce our own food. Farmers are the most important people in our lives, yet we don’t know who they are, and between them and us, there are a series of middlemen who’ve increasingly made the farmer so marginal, that farmers are being forced to use destructive short term solutions to deal with the threats to their financial wellbeing. Farmers no longer have identity. Instead of nurturing farmers, we’ve allowed the middlemen to turn these custodians of the land and its wild denizens into mass murderers on our behalf just so that we can tuck into a lamb chop or slather a slice of bread with butter. There’s a cost to both us for this new arrangement that we don’t yet fully understand or comprehend. Cities, the biome created by humans for themselves. We now live in cities. But don’t know how to live in them. They’re a relatively new environment for humans and we haven’t evolved our thinking or implemented change fast enough to reduce their impact on wild and rural environments. To boot, we haven’t really looked at the cost to our wellbeing, nor how we maintain or regenerate it. Then there’s us. I’ve coined a phrase special phrase for us: The Forgetting Generation. The longer we live in cities, the more we forget. And it’s a terrible downwards spiral. Children grow up believing that food comes shrink-wrapped in polystyrene and can no longer relate to the living breathing animals that are slaughtered for the pot. We no longer bake our own bread or know our neighbours. We forget when we should be remembering, and as a result, we’re slowly losing our natural awareness and are increasingly becoming reliant on those that don’t have our best interests at heart. If the city is the biome we’re going to choose to live in, we better learn how to live in them lightly, and fast, or suffer the consequences of a sterile and toxic future. When I started looking at this multifaceted crisis there were a couple of epiphanies: Whatever I did to help us remember would have to be managed, be financially sustainable, expandable, replicate-able, focus on children (and in turn their families and the broader community), create biologically diverse environments, regenerate the fringes of the urban landscape and most importantly, do good for all of us. To best help children remember and become the agents of change for their communities, we largely work with schools. 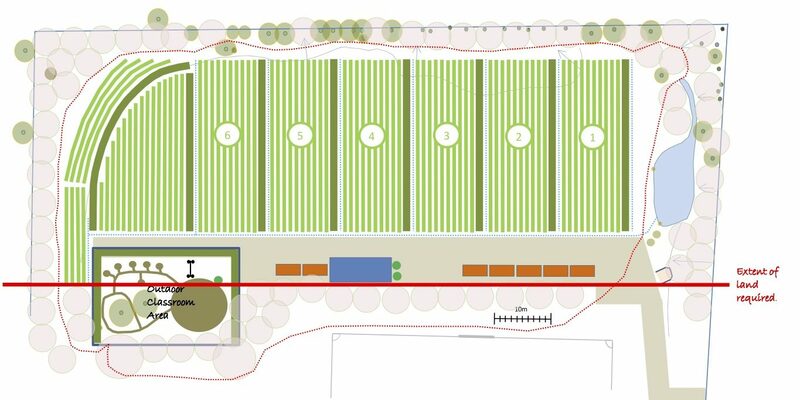 We then use permaculture to design a short, medium and long term productive and regenerative plan for the entire school property. We must harvest rainwater, plant the rain, and plumb surplus rainwater back into the sanitation reticulation system. Our first focus is water security. This is especially relevant to Cape Town as it’s become a food desert in the middle of the worst drought in living memory. It’s important to remember that wherever you grow food, there is a water cost, but only where you grow food, is their food security. Those naysayers that say we can ill afford to use water for agriculture in urban environments are truly short sighted. Instead of future proofing cities, they would prefer to jump on the water crisis bandwagon and imagine that using less water is a long-term solution. To mitigate our water usage, we use a number of proven techniques: We harvest rain water for the permaculture plan, plumb the surplus rain water back into the school’s sanitation reticulation system and look at how to best plant the rain. Whether cities are in dry land environments, or are water rich – how we look at, use and conserve water should be an urban dweller priority. Then there’s the outdoor classroom. 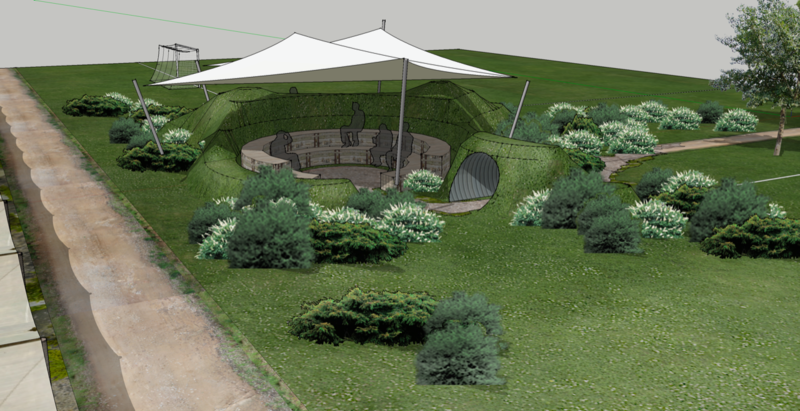 A space homed in a biologically rich environment where teachers can give children edible education. Where an education syllabus can be brought to life. Geography, science, biology, even economics and mathematics – all have their roots in nature and the outdoors. Finally, the project has at its heart market gardens that generate a small turnover to keep the project economically sustainable. This means we can pay for permanent employees from previously disadvantaged communities through the daily sale of nutrient rich, organic produce into neighbourhoods while re-connecting children to where their food actually comes from. 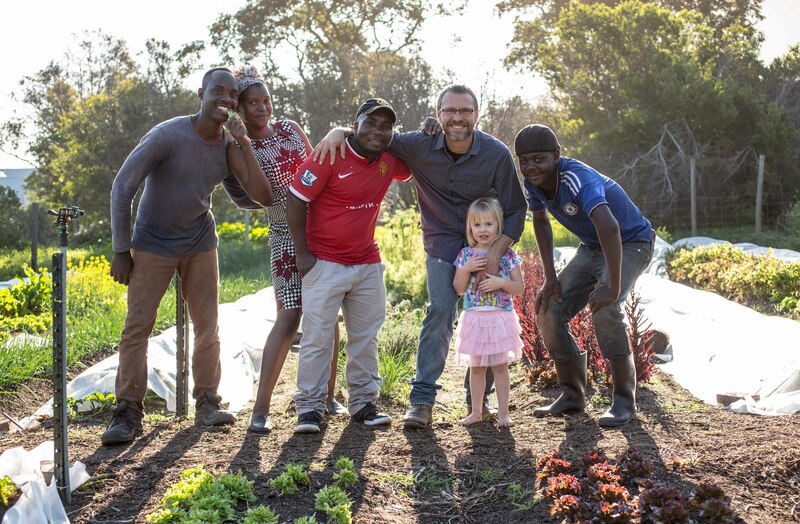 Myself and my daughter with the team at Metro Organics – a market garden in Noordhoek. My hope… to claw back a balance between our needs and desires. That give children the tools and the right environment to break the cycle of disconnect and re-create a cycle of mutual respect and empathy – where they can remember instead of forgetting. That we get to know our neighbours and borrow that cup of sugar. That we re-create the cultural memory of our village. That we keep our economy local, and keep re-investing in ourselves and each other in our own neighbourhoods. That we change our urban living philosophy, and in turn, as we all start to remember and we re-empower the farmer, we might be saving the last leopards of the Cape Fold Mountains of Southern Africa. Why is it important to bring working gardens to city neighbourhoods? I don’t see Neighbourhood Farms as bringing working gardens into city neighbourhoods, so much as creating a network of urban farmers that re-create the village of our cultural memory. The trust and faith we’ve placed on the urban food supply chain is built on a disconnected system. We need to re-create a network of trust and accountability, that has as its primary focus the wellbeing of our neighbourhoods. Then there’s all the other positive spinoff’s: Social engagement, reduction in crime, nutrient dense produce available with a tiny carbon footprint, education of children… the list continues. I always say we need to learn to live in cities and believe that Neighbourhood Farms are key to this evolution. What does working with soil, water, nurturing, growing and harvesting plants, etc., (the labour of tending a garden and seeing the rewards) teach you/help you realise? Ultimately, growing our own food is primarily about sowing seeds to reap a regenerative future, but to understand the importance of growing my own food, of working the earth, I need to take a little trip down memory lane. We spent hundreds of thousands of years being hunter / gatherers and by necessity, were very finely tuned to the natural flow and ebb of the ecosystems. A little over 10000 years ago, we domesticated animals and developed agriculture and this in turn allowed us to develop cities. The last 100 years of living in cities have made us un-learn that evolutionary IQ and made us the forgetting generation. Growing, nurturing and harvesting the fruits of your labour teach you about the intricate connections between what we eat and the natural ecosystems, the flow between the seasons, the importance of water. At home, I have a 200m2 organic permaculture garden that not only provides my family with daily, nutrient dense produce (in the thick of the worst drought in recorded memory in Cape Town) – but helps me to remember, and more importantly makes sure that my children break the cycle, and don’t become the forgetting generation. ← 12023 kilometers and counting….